Are you thinking of investing in Litecoin? What is our Litecoin (LTC) price prediction? Let’s take a look at the fundamentals and technicals to discover where the seventh-ranked cryptocurrency is heading this month. Here is our (LTC) Litecoin Price Prediction and Forecast. Litecoin (LTC) is a peer-to-peer digital currency and open-source software project which is nearly identical to Bitcoin (BTC). In fact, if bitcoin is ‘digital gold,’ Litecoin fashions itself as ‘digital silver’ — and largely piggybacks on everything Bitcoin does. This fact is both Litecoin’s greatest strength and its greatest weakness. In late Jan and early Feb 2019, members of the Litecoin Foundation made statements about adding enhanced privacy features to LTC. First, Charlie Lee announced his intention to add confidential transactions to the LTC blockchain on Jan 28, 2019. Franklyn Richards furthered the discussion and added that the Foundation was looking to integrate the Mimblewimble protocol into LTC using a soft fork. Mimblewimble integrates both confidential transaction and CoinJoin innovations to encrypt transaction amounts and their sources. It enables the buyer and seller to remain more anonymous. If Mimblewimble were integrated, the fungibility, privacy, and scalability of LTC could greatly increase while avoiding the contentions of a hard fork. Furthermore, it would add significant market differentiation to the cryptocurrency. Currently, Beam (BEAM) and Grin (GRIN) are the only two coins to use Mimbelwimble. If you could send me the final edition after revisions or edits so I have the word count, it would be greatly appreciated. Like its big brother, Bitcoin, Litecoin supports the soft-fork change in transaction format called Segregated Witness — more commonly known as Segwit. The upgrade continues to become more widely adopted as time progresses, and is an example of how Litecoin benefits from having the same core technology like Bitcoin. Just as Litecoin supports Segwit, it also supports the highly-anticipated second-layer payment protocol called The Lightning Network. The Lightning Network plans to enable lightning-fast micropayments between participating nodes and is quickly becoming a viable solution to Bitcoin’s scaleability concerns — at least for small payments. The Lightning Network is less notably connected to Litecoin, but it is important to note that a successful Lightning Network is not only good for BTC but also LTC. Litecoin (LTC) is exchanged on virtually every cryptocurrency exchange under the sun, and cryptocurrency traders would be hard-pressed to find a reliable exchange which doesn’t support the seventh-ranked cryptocurrency. Litecoin’s current 24-hour trading volume across tracked exchanges is $375,810,001 USD, according to CoinMarketCap.com. Litecoin can be stored on most of the most popular hardware wallets, including the CoolWallet S, Opendime, Ledger Nano S, Trezor, KeepKey, and BitBox. Investors, traders, and hodlers of Litecoin should have no problem finding storing solutions and trading platforms for their LTC. Litecoin was created by former Google and Coinbase employee Charlie Lee. Lee famously sold all of his Litecoin at the very top of the cryptocurrency bubble, when LTC was at its all-time high. The creator cited a conflict of interest as the primary reason for selling his stockpile of the cryptocurrency. Not everyone is convinced that Lee sold his Litecoins for benevolent reasons — especially given the fact that he sold at the very top and undoubtedly earned a sizeable profit. Prominent silver bull and YouTuber ‘TruthNever Told’ believes Charlie Lee’s Litecoin sale was little more than cashing out of a Ponzi scheme, in which the creator created a rip-off of Bitcoin with no intrinsic value, convinced investors that it was valuable, and then cashed out at the top. While his argument is persuasive, it is worth noting that the YouTuber in question believes all cryptocurrencies are effectively worthless — and thus his opinion should probably not be factored in too seriously when discussing price predictions and forecasts. 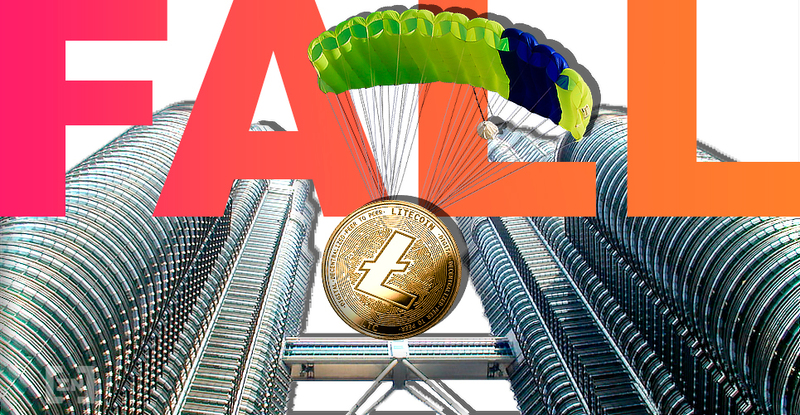 In February 2018, Litecoin (LTC) experienced a strong pump off the news that LitePay — a credit card-like LTC payment solution for vendors — would accelerate adoption of the cryptocurrency in the retail sector. Those hoping to easily use their LTC at retail vendors were sadly disappointed, however, when the project shut down only one month later. LitePay CEO Kenneth Asare shut down all operations and made preparations to sell the company at the end of March. Since then, the project has gone entirely dormant. At the time of this writing, the official LitePay website displays a simple logo and nothing else. Charlie Lee himself apologized for hyping up the project. Though mistakes happen and it was good of Lee to apologize, BeInCrypto believes this instance further damaged the creator’s reputation. LitePay serves as an example of why investors should not buy into the hype and conduct their own due diligence on hype-related developments connected to altcoins. Perhaps the biggest problem for Litecoin is the fact that Bitcoin — the first and foremost cryptocurrency which Litecoin essentially just copied — is better. Litecoin is merely a tag-along riding Bitcoin’s coattails, and that is unlikely to change — at least, for the near future. In the long-term, should cryptocurrencies succeed to the point where it is legitimately difficult to get ahold of Bitcoins, Litecoin may see success in the retail sector as a more effective means of payment. In essence, Litecoin could become a more effective cryptocurrency — but don’t hold your breath. In late January and early February of 2019, members of the Litecoin Foundation made statements about adding enhanced privacy features to LTC. First, Charlie Lee announced his intention to add confidential transactions to the LTC blockchain on Jan 28, 2019. Franklyn Richards furthered the discussion and added that the Foundation was looking to integrate the Mimblewimble protocol into LTC using a soft fork. Mimblewimble integrates both confidential transactions and takes advantage of CoinJoin innovations to encrypt sources and transaction amounts. It enables the buyer and seller to remain more anonymous. If Mimblewimble were integrated, the fungibility, privacy, and scalability of LTC could greatly increase while avoiding the contentions of a hard fork. Furthermore, it would add significant market differentiation to the cryptocurrency. Currently, Beam (BEAM) and Grin (GRIN) are the only two coins to use Mimbelwimble. In Aug 2019, LTC is expected to undergo its second halving. This means that the mining reward will be cut in half from 25 LTC to just 12.5 LTC. This could disincentivize miners to continue mining. In order for miners to continue earning at their current rate, the value of LTC will have to double or transaction fees must significantly increase. An increase in transaction fees may disincentivize the use of LTC. The building of sponsorships and partnerships with organizations like TokenPay, Ultimate Fighting Championship (UFC), Mammoth Film Festival, and others may increase the value of LTC and, thus, the mining reward. The big picture of Litecoin (LTC) doesn’t paint a particularly pretty picture. Litecoin has fallen significantly harder than its big brother, Bitcoin, throughout 2018’s bear market. The price of one coin reached nearly $350 on December 19, 2017. It has since crashed to nearly $50, representing an approximate loss of 86 percent. Worse yet, Litecoin’s downfall has comprised an almost full retracement over the last 365 days. Thus, the Litecoin forecast doesn’t look too great. Proponents of Litecoin who have been beating the ‘buy the dip’ drum all year have been fond of saying such things as ‘it’s never going to fall below $250 again.’ Afterward, they said ‘it’s never going to fall below $200 again.’ Get the picture, here? At the time of this writing, the Litecoin price today is $58.59 USD. It may be useful to weigh other Litecoin predictions from other popular prediction outlets. Popular cryptocurrency prediction website WalletInvestor currently has a one-year forecast of 135.849 USD for Litecoin. However, the website makes use of artificial intelligence and machine learning when making its predictions, and this doesn’t take into account fundamentals and shouldn’t be taken as valid in and of itself. LitecoinForecast.com is ultra bullish, predicting Bitcoin’s little brother will reach 437.17 USD in February 2019. In order for this to happen, the market would have to become exceptionally bullish and surpass previous all-time highs in market cap in only a matter of months. It is our opinion that this is highly unlikely. When trading against BTC, AltcoinForecast.com sees LTC losing out and continuing its downtrend in Satoshi valuation. At the time of this writing, one Litecoin is worth 0.00885000. By February 2019, the website predicts that number will have decreased all the way down to 0.00177027. It is our opinion that this prediction is perhaps a bit too bearish — but we agree that Litecoin has no reason to outperform Bitcoin by that time. LongForecast.com predicts Litecoin will only reach a high of 63 USD next year — and it will happen in January. We think this may be too conservative, as price fluctuations in the cryptocurrency market happen very rapidly. For this prediction to come true, the wider cryptocurrency market would have to stagnate significantly for the entirety of 2019. After weighing the fundamentals, technicals, and overall cryptocurrency market situation, it is our opinion that Litecoin (LTC) will stagnate throughout 2019. It may reach lows around $40. On the flipside, it may reach highs of $75. This will be determined almost entirely by Bitcoin’s price movement, as the market leader is currently wedged in between key support and key resistance. What do you think of our Litecoin (LTC) price prediction for 2019? Let us know your own predictions in the comments below! Also, check out our previous article on our Stellar Lumens (XLM) price prediction, as well as our Cardano (ADA) price prediction, as well! Keep a look out for our full Litecoin Price Prediction 2018 and Litecoin Price Prediction 2019. Also stay tuned for analysis on more market leaders like Bitcoin and Bitcoin Cash, as well and more long and short term forecasts for your favorite altcoins. Images courtesy of Shutterstock, YouTube, LitePay, CoinMarketCap.